The city of Philadelphia has actively been planning for Pope Francis's upcoming visit, and a local member of the clergy has been making preparations of his own. 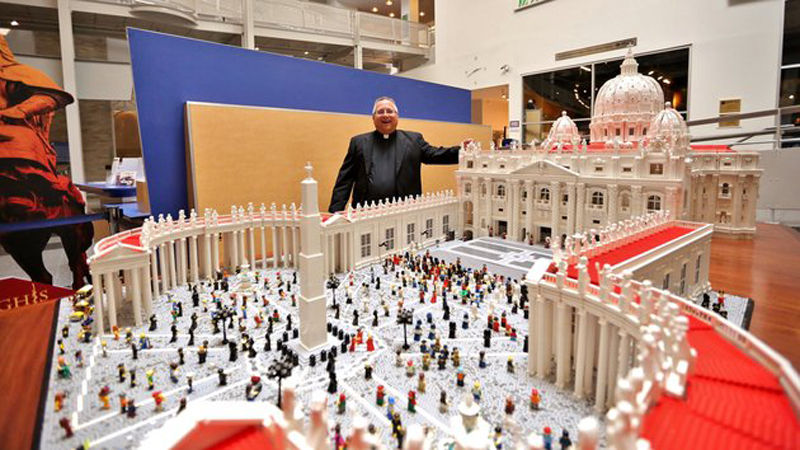 The Reverend Bob Simon, a pastor at St. Catherine of Siena Church in Moscow, Pennsylvania, has spent the last 10 months building a LEGO representation of the Vatican! The ambitious LEGO display, which recreates St.Mark’s Basilica and Square, includes more than half a million LEGO pieces. The entire creation is rendered in impressive detail from the Corinthian columns to the pristine white building to the guards in front. Simon was faithful down to the scene’s minutiae, including the safety blockades that keep the masses from the holy leader, quite a few tourists with LEGO cameras (we spotted a nun with a selfie stick! ), and even The Pope’s skullcap. The LEGO Vatican was actually a project Simon had dreamed about since he was in middle school and had made a few, half-hearted attempts in the past. For his most recent and successful venture, Simon began gathering blocks about two years ago and then put his plan into action in honor of The Pope’s visit to Philadelphia. The LEGO Vatican display is currently on view at The Franklin Institute in Philadelphia, a science museum that also is featuring a Vatican Splendors exhibit at this time. 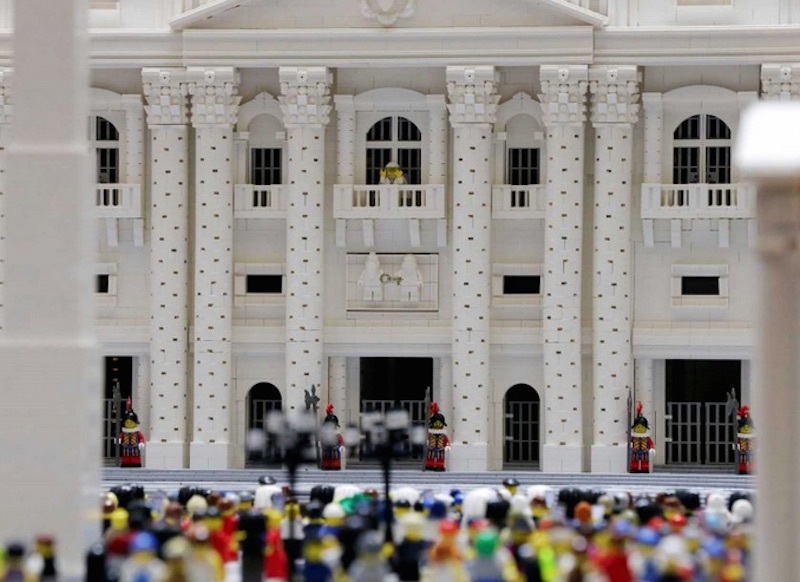 The Pope is scheduled to arrive in Philadelphia the weekend of September 25-27th and sadly will be unlikely to see the amazing LEGO display created in his honor. The ambitious LEGO display, which recreates St. Mark's Basilica and Square, includes more than half a million LEGO pieces. The entire creation is rendered in impressive detail from the Corinthian columns to the pristine white building to the guards in front. Simon was faithful down to the scene's minutiae, including the safety blockades that keep the masses from the holy leader, quite a few tourists with LEGO cameras (we spotted a nun with a selfie stick! ), and even The Pope's skullcap. The LEGO Vatican was actually a project Simon had dreamed about since he was in middle school and had made a few, half-hearted attempts in the past. For his most recent and successful venture, Simon began gathering blocks about two years ago and then put his plan into action in honor of The Pope's visit to Philadelphia. The LEGO Vatican is an impressive feat of building with LEGO bricks!